The Newfoundland dog breed is perfect for someone who wants a large, easygoing dog that can also double as a lifeguard. These sweet dogs are known to be great for families as well as sole owners. Their social personalities make them suitable for houses with a lot of people going in and out. This breed is not known to be too intense either, making them suitable for most owners. This breed is known to be very social. They like being around their owners and their families, and especially hate being alone. 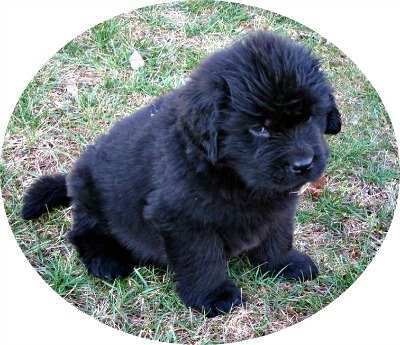 Newfoundlands are prone to separation anxiety, and should not be left alone for prolonged periods of time. If they’re alone for too long, they may start barking or chewing on the furniture. These dogs have gentle, calm personalities, making them capable of living with children. They also find vocations as service and therapy dogs with their affection. Older owners also believe that the Newfoundland dog breed can live at their pace, with no rush brought from the dog. 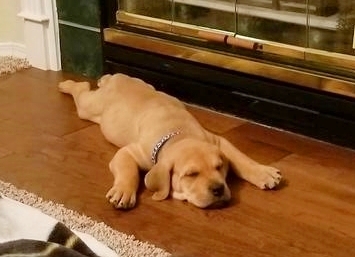 For people considering getting their first dog, this breed is an excellent choice. They aren’t just social with their friends on two legs. 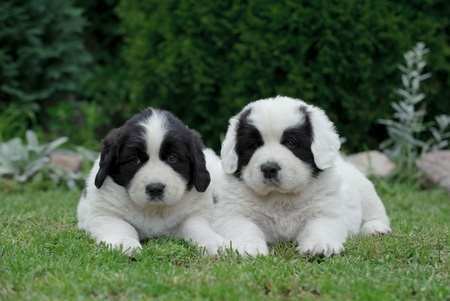 Newfoundlands are capable of coexisting quite well with other canines and pets. Their giant size can become a danger to smaller pets, but this dog is hardly ever aggressive. 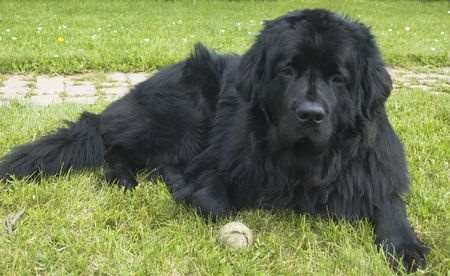 This breed can share a house quite well, and a well socialized Newfie is a great addition to the family. The Newfoundland dog breed is also known for being good with children. Their gentle and social personalities make for fun, unintimidating dogs. Their size puts small children in danger of being knocked over, however, so they should be monitored when playing. Children must be aware of the dog’s boundaries before interacting with them, although, to prevent unwanted ear or tail pulling. Being a big dog, the Newfoundland manages to work up quite an appetite. It’s important to monitor their food intake compared to the amount of exercise they get. Otherwise, the dog may become obese, unhealthy, and unhappy. Large dogs like this require a decent amount of daily exercise to keep them in shape. The Newfoundland dog breed needs lots of space to roam and access to water because they love to swim. While their personalities make them fit in most environments, it’s best if they have a lot of property to play around on. These dogs should have an enclosure when outside, as they are known to chase after the odd squirrel. They require a sturdy, tall fence; an invisible fence won’t cut it with this breed. The Newfoundland dog breed is known to be a moderately vocal breed. When they do bark though, you can hear it from ways away. They aren’t good for owners who are or have neighbors sensitive to high volumes. This also makes them less suitable for apartments. These dogs typically bark when alerted by something, so they aren’t great for areas with high population density, human or wildlife. I found this video and couldn't help thinking that Newfies seem to have the most fun. 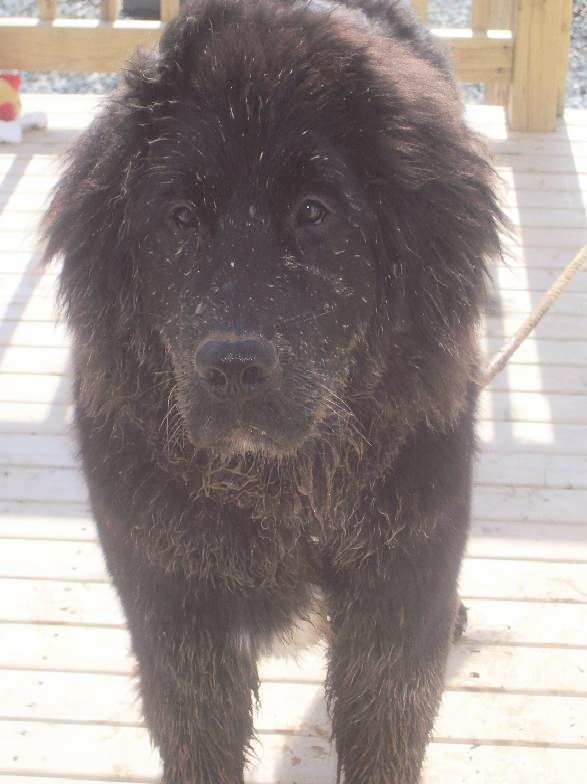 The history of the Newfoundland begins appropriately in Newfoundland, the province of Canada for which the dog is named. How the dog ended up there, however, is up to debate. Most breeders believe it was a product of mix breeding in Europe, later brought to Newfoundland. Whatever the origin of the Newfoundland may be, their purpose there is fairly well known. These dogs were often used by fishermen, utilizing their thick coats to help them work on the icy waters of the northern Atlantic. They were also used for their strong physical builds, put to work hauling carts of merchandise and other materials. While the Newfoundland is believed to have been around for a while, early depictions of the dog arrived around the late 1800s. As more people came to visit the new world, they brought back souvenirs, like this breed. These dogs soon made their way to Britain, where they gained much popularity and grew in numbers. Many Newfoundlands faced an uncertain future in their home province. 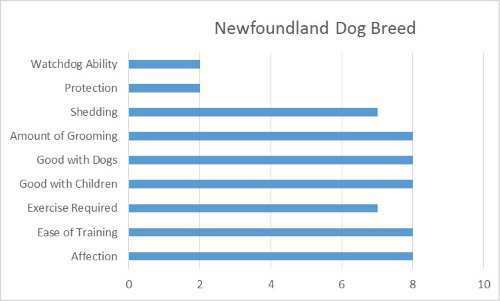 Canadian government restrictions made owning a dog expensive, actually leading to the breed’s drop in population. Owners were abandoning or euthanizing their dogs as a result of these sanctions. If it were not for the breed’s success in Europe, it might not have survived. In Britain, the Newfoundland saw great success and soon enjoyed some popularity. In the 19th century, it was once again assuming its role as a working dog. This breed’s strength was adopted again for hauling heavy things for its owner, a job they enjoy and do best. It saw its numbers and popularity increase in the years approaching the World Wars. The World Wars caused the decline of many breeds, as well as the extinction of some. The Newfoundland, along with most breeds, was put on the backburner. Breeding was focused on during interval between the two wars, but once again saw its importance dropped with the emergence of the second. In the US, many breeds found refuge from the chaos. The Newfoundland gained much popularity in the US in the years following WWII. The US economy was booming due to the wartime industries, allowing for the average family to afford a higher standard of living. Owning a pet was more practical, so many breeds soon saw a jump in population. These dogs continue to rise in popularity to this day, and they are considered to be the 36th most popular breed in the US. 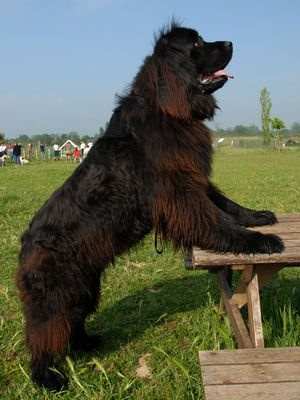 The Newfoundland was registered by the AKC in 1886. In 2015, they were ranked 36th in popularity with the American Kennel Club. The Newfoundland proves to be a fairly easy dog to train. Given how social and intelligent they are, they are often eager and able to learn. Their loyalty to their owner makes commanding the dog’s attention a smooth process. Despite their burly appearance, they are known to be sensitive dogs. Positive reinforcement is the ideal route for training this breed. Owners will often take their Newfoundlands to obedience classes to ease the training process. These classes will teach basic commands and tricks for training the dog. Taking a dog to classes will also help condition their owner’s position of authority. These dogs do not take long to housebreak either. Given their social personalities, it doesn’t take much effort to warm a Newfoundland up to guests. Owners have more trouble keeping these dogs away from their guests than teaching them how to behave around them. These reserved dogs are great for having people over, so long as they don’t mind getting hair all over them. Despite their social and calm demeanor, it’s important to socialize a Newfoundland. Early socialization with other pets and people will make the dog more relaxed. Exposing the dog to many sights and sounds early on will make them more comfortable in their environment. Taking the dog on many walks and to obedience classes is a good way to accomplish this. The Newfoundland is not a bad choice when it comes to protecting you, your family, and your property. Their heavy build carries an intimidation factor with it. Their muscular body can also pack a punch, so they could quickly knock down the average intruder. Newfoundlands work as watch dogs too. Their booming barks can easily be heard so they can alert their owner to the presence of an intruder. It is not a wary breed, and they do not bark much even when they are on their guard. There are better breeds to choose from when it comes to defending the property. Overall, the Newfoundland may not be the best dog regarding protection. It may display a muscular build, but this breed is not inclined to hurt anyone. They tend to be all bark and no bite, using their intimidation rather than action. The Newfoundland is notoriously a difficult dog to groom. Their thick coats that protected them from the icy waters of their home prove to be great for trapping dirt, mud, and anything else they’ve been rolling in. This breed requires monthly bathing or bathing as needed. They are seasonal heavy shedders as well, so they need to be brushed 2-3 times a week, during these periods. Owners will also take their Newfies to groomers to trim their coats or groom them to a more professional standard. It’s important to take care of a dog’s nails too. If a dog’s nails become too long, they can become uncomfortable, and even painful. A good way to tell when a dog’s nails are too long is if they can be heard clicking against the ground as the dog moves. If not, it’s safe to assume they’ll need them clipped about once a month. It’s just as important to brush a Newfoundland’s teeth as well as its coat. 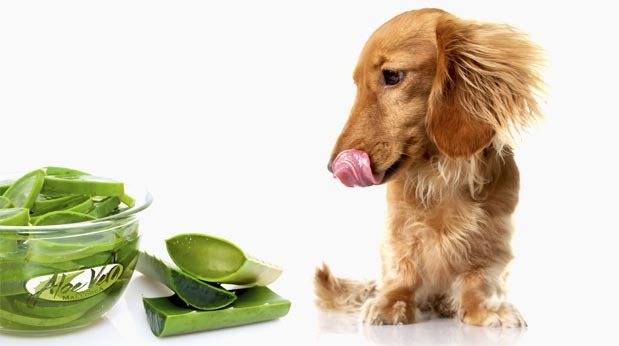 It’s important to provide ample dental care to keep the dog healthy and happy. Regular brushing will remove plaque, prevent tartar buildup, and keep the dog’s breath fresh. It’s recommended that these dogs have their teeth brushed 2-3 times a week. All dogs are probably going to be affected by some health issue down the road. Some breeds are more prone to certain health conditions than others, however, and it is important to be aware of them when buying a dog. 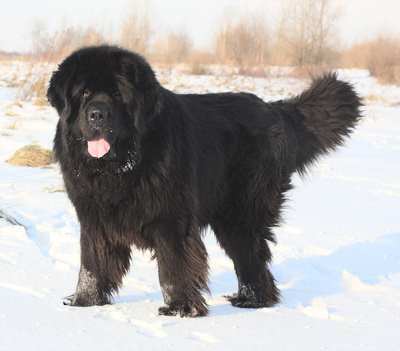 This breed is relatively popular, so it’s especially important to find a reputable breeder when purchasing a Newfoundland. A good breeder will be knowledgeable about the breed and its possible health issues, as well as pass health checks for their dogs. If you think this might be the breed of your dreams, please consider doing a little more reading. The books below come highly recommended - click on the links or images for more information.